Over the weekend, my Chicken in Chocolate and Chile Sauce (Mole Poblano de Pollo) went from "what you've got now isn't edible" to "this is great" "definitely make it again". My husband normally is quite supportive of my recipes but I admit he was right. 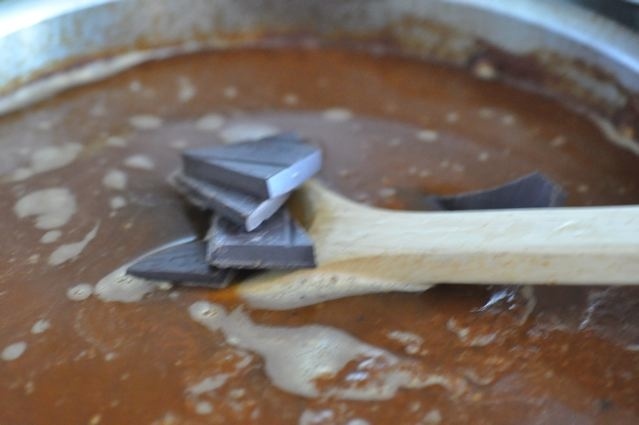 The "classic" recipe I started with and eventually abandoned called for bittersweet chocolate and an overpowering amount of cloves which had ruined this gorgeous sauce. That is until I made a mid-course correction. Mole (pronounced MOH-lay) Poblano is upscale Mexican sauce that's piquant with a hint of chocolate and a slight sweetness that is typically reserved for festivals and holidays. 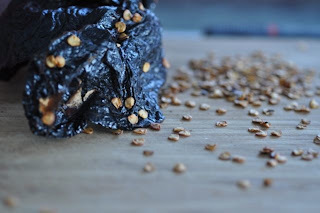 There are as many Mole Poblano recipes as there are Mexican grandmothers (and home chefs) but the core ingredients are similar. 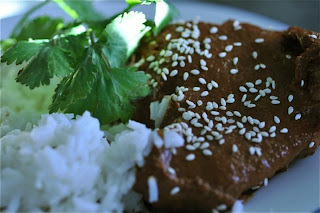 If you like mole sauce, you should add my recipe to your "must make" list. 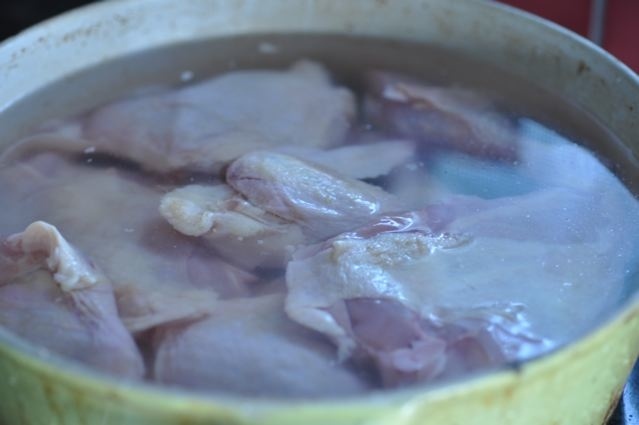 Chicken or the traditional Turkey, is cooked until tender in water. 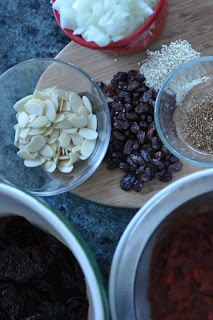 and measured out the almonds (or some combination of almonds, peanuts, pumpkin seeds and/or sunflower seeds), onions, tomatoes, raisins, sesame seeds, and garlic .These are all the traditional ingredients of a Mole Poblano. I threw it all in the blender jar and whirred it into a thick creamy sauce before putting it into a large skillet. The most important ingredient, of course is chocolate which is unsweetened (or bittersweet - fair trade and organic, of course). Be careful not to burn the chocolate -- keep the flame low. Most recipes include a tortilla that's been broken up or pieces of stale white bread that gets blended into the sauce as a thickener. 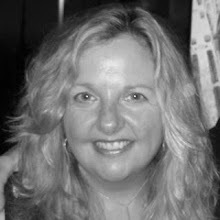 In my research I found wild variation from recipe to recipe on the spice measurements. Cinnamon is a common to most and so are ground anise or fennel seeds. I had anise and ground it in a spice mill along with all the other spices listed in the recipe. I share with you that recipes vary with 1/4 to 1 teaspoon of each spice per five cups of liquid which is made up primarily of tomatoes and chicken stock. I made a good guess that 1/2 teaspoon of each spice was a perfect compromise. Slightly less common are coriander seeds (more typical is fresh cilantro), and cloves (I recommend 1/8 of a teaspoon). 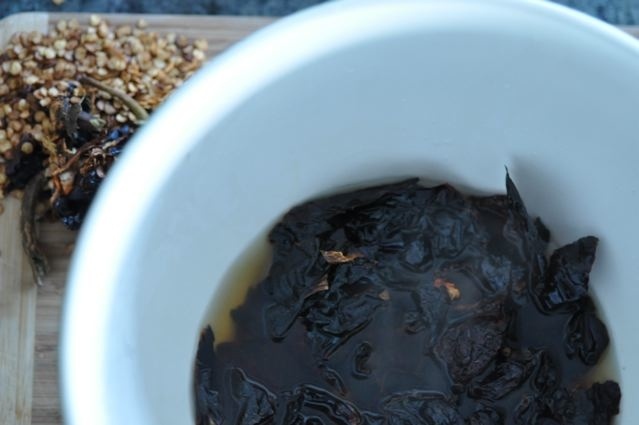 Of the dozens of recipes I read, one included allspice berries. I decided not to include allspice but will try it next time (my bottle seemed a little old and there was not much fragrance coming from the jar)! After adding the chocolate, my sauce lacked any hint of sweetness. It was downright bitter and uber clovey. In coming up with a game plan for "fixing" the ruined sauce, I had to think on my feet. More tomato would dilute the clove, check, a little sugar would sweeten the bitter chocolate flavor, check, and peanut butter, yes peanut butter, would help neutralize the bitterness even more. After adding more pureed tomatoes, I added sugar and peanut butter just one tablespoon at a time tasting between each addition. The recipe below is the perfect combination of piquant and slightly sweet (at least according me my husband's and my palettes). NOTES: wear rubber gloves when handling chilies and keep your fingers away from your eyes. 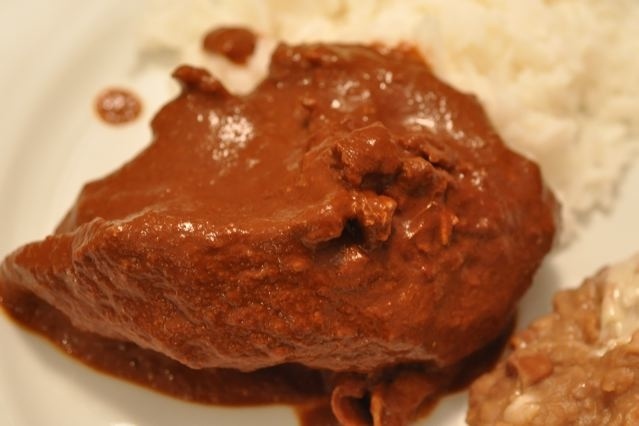 There is plenty of mole sauce for two chickens or one turkey (or leftovers if you want to cook just one chicken. 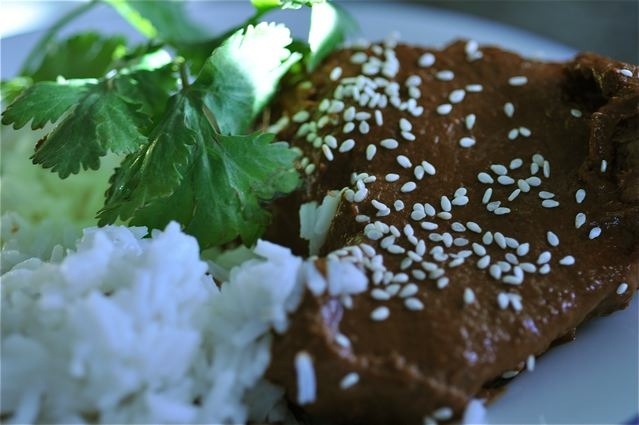 Mole is great on grilled pork tenderloin). A good quality vegetable oil is substituted for the more traditional lard. Place the chicken or turkey in a 4 to 5 quart heavy Dutch oven. Cover with water and bring to a boil over high heat. Once boiling, reduce to low heat, cover the pot and simmer for 45 minutes to one hour or until the meat is cooked through and tender. Remove the chicken from the stock and set aside. The stock may be used for the mole sauce or reserved for a future recipe. Mole sauce: remove the stems from the chilies. 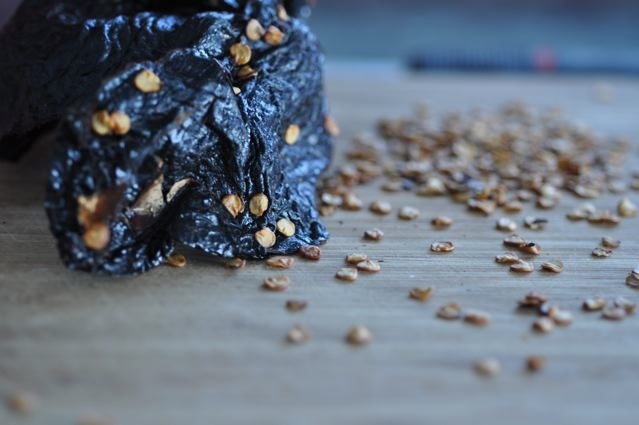 Cut the chiles open, and using your finger or the back of a knife brush off the seeds being sure to invert the chili to expose any hidden seeds. Remove ribs from the chilies then tear chilies into small pieces. In a large bowl, heat half of the chicken stock, or 2 cups, pour the hot stock over the chiles. Soak them for at least a half hour. In a blender or food processor pulverize the almonds to a powder. Push the almonds through a sieve to remove any large pieces and return them to the blender. Add the chilies, the chicken stock used to soften the chilies, chopped onions, tomatoes, raisins, tablespoons of sesame seeds, tortilla, garlic, and ground spices. You may need to work in batches depending on the size of your carafe or bowl. Start on low and gradually turn up to high speed until the mixture is a smooth puree. Depending on your blender, you may need to stir the puree occasionally and push down the whole ingredients as the sauce will be thick and may cause your blender to stop pureeing. In a heavy 10" skillet, add 1 tablespoon of vegetable oil over moderate heat. Pour in the mole and simmer, stirring frequently, for about five minutes. Add the remaining chicken stock, stir to incorporate, the add the chocolate pieces. Cook, uncovered, over low, stirring until the chocolate has melted. 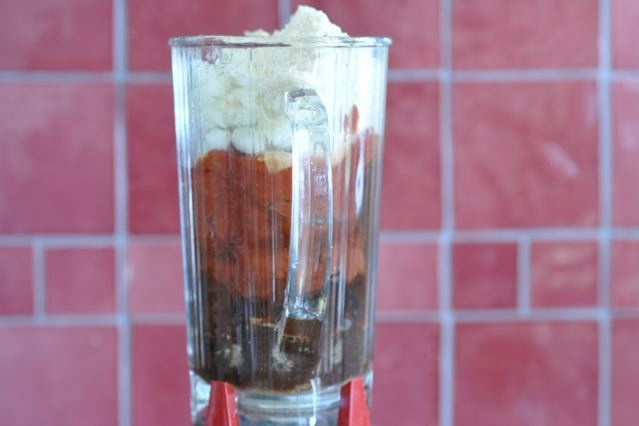 This is a critical point to taste the mole sauce and decide how much sugar and peanut butter you want to add. If the sauce is bitter, add sugar, one tablespoon at a time. Stir and taste after each addition. If the chiles are overpowering, add more tomato sauce. Add peanut butter 1 tablespoon at a time. Stir and taste after each addition. If additional chocolate is desired be sure to add sugar, if needed. Remove from heat, cover and set aside. Pat dry the turkey or chicken before browning using paper towels. Add 3 tablespoons of vegetable oil to the Dutch oven and heat over medium flame. Add the chicken or turkey pieces and brown them well on all sides, turning them frequently so they don't burn. Add the mole sauce to cover the chicken turning the pieces in the sauce to cover them evenly. Cover the skillet and simmer over low for about a half an hour. Check 2 or 3 times and baste the chicken with the mole sauce to keep it moist. Serve with rice. Garnish with sesame seeds and a few sprigs of cilantro, if desired. A friend mine who is of Mexican heritage says his grandmother took two days to make a Mole Poblano. She started with fresh chiles, which took two days to sun dry, and made the smooth and creamy sauce by hand. Modern appliances -- blender/food processor/spice grinder -- and a mesh strainer make this recipe relatively easy, but it does take time to simmer the sauce.